A traditional Muslim dish from the Malabar region of Kerala, Neichoru or Ghee Rice is prepared on all special occasions. 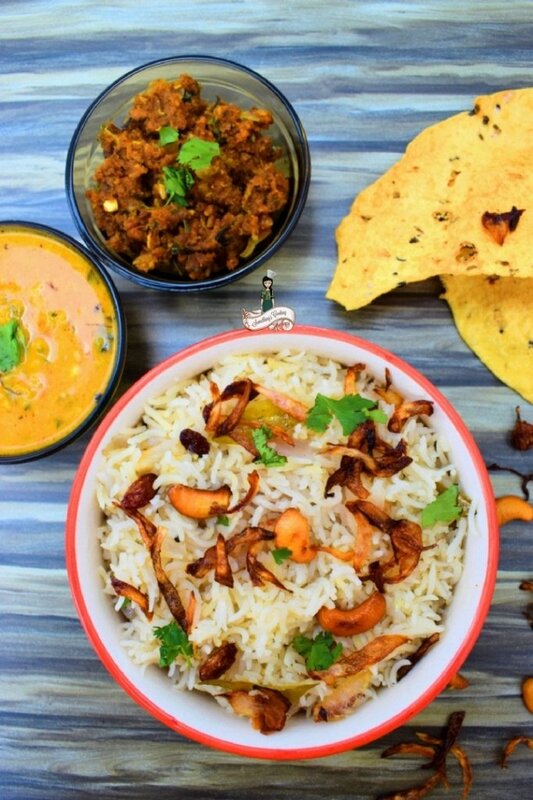 A quick to make and easy dish, Neichoru is cooked with clarified ghee, spices and dry fruits. A personal lunch invite in the Forces expects the invitees to arrive at 1 pm on which beer and cold drinks are offered. Light snacks are shown around by the hostess and both the host and the hostess would go around all the guests to see if they are partaking in the offerings and if they require re-fills. Lunch is served anytime between 2 to 3 pm, depending upon the formality of the occasion. Now a lunch in the Officer’s Mess would mostly be formal, with designated seating, a sumptuous menu, the finest tableware and gleaming silver. It could be casual and buffet-style where you can sit anywhere you please. Protocol codes are, however, always followed. The waiter would announce that the lunch is served. The Commanding Officer’s wife would request any visiting ladies to the dining room with her. The other ladies of the regiment would follow, usually according to the seniority of their husbands. If the lunch is just a regular affair, the Commanding Officer’s wife would be the first to start. The protocol is applicable to the Officers as well. They would saunter in, helping themselves. Today I am sharing a recipe, which is often my go-to during such personal lunches or dinners. The best part is that it is easy and quick to prepare. That doesn’t mean it affects its grandeur. Kerala Style Ghee Rice has always been prepared for special occasions like a wedding or festivals. Neichoru is usually served along with a non-vegetarian curry, usually a Mutton or Chicken Curry. However, you should serve with a regular Dal Curry or Kerala Style Parippu (Dal) curry to relish its true deliciousness. I also serve Pappad alongside and the husband has always been bowled over. 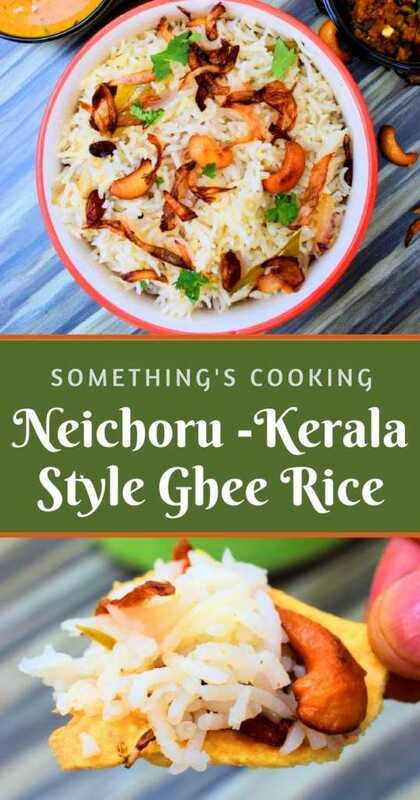 So when you do not want to put in the effort of making a Biriyani, want something other than Jeera Rice but in almost the same grandeur, go for Ghee Rice. The aroma and flavor would definitely make you want to prepare this every other day. Traditionally, Neichoru is prepared with Jeerakasala Rice or Kaima rice, It is a short grain rice with a distinct flavor of its own. You can prepare Ghee rice with basmati rice as well. Wash and drain rice a few times. Keep aside. Heat 2 tbsp ghee in a pan and roast the cashews and raisins. Remove and keep aside. Also fry an onion that is finely sliced. This is for garnish. Remove. In the same pan, add the remaining ghee, and saute the dry spices inc. star anise, cloves, cinnamon, and bay leaf. Add the remaining finely sliced onion and saute till golden brown. Add drained rice and saute till the water is evaporated. Be gentle, the rice shouldn't break. Cook rice adding water and salt. You can transfer these to a pressure cooker and cook for two whistles on high flame. You can also use a rice cooker or cook in a pot and drain of excess water. If you are using the latter method, it may take upto 8 mins, depending upon the quality of rice. Once cooked, fluff up the rice using a fork, this will separate the rice grains. 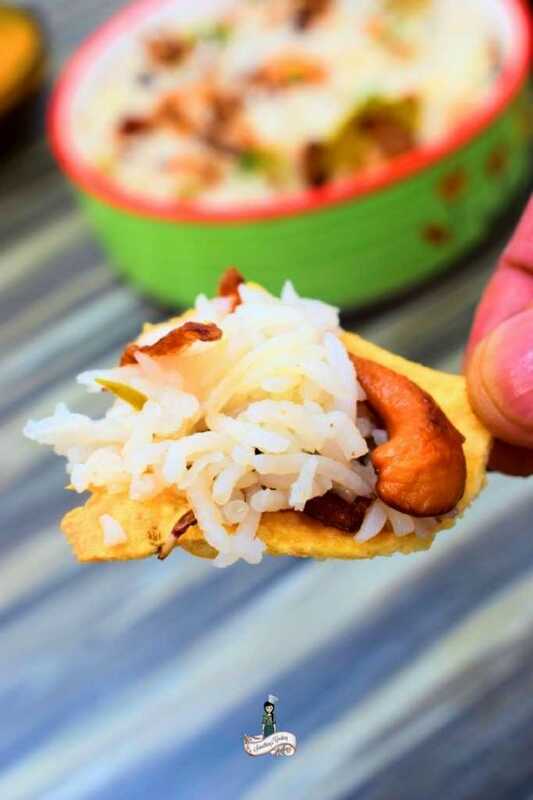 Garnish with fried cashews, raisins and onions. I have served the Kerala Style Ghee Rice aka Neichoru with Dal Tadka, Mutton Keema and Pappad. Like it? Pin it for later! Ummmmm this looks and sounds so delish Shalzz depsite all the ghee in it! I will make and sahre a pic as soon as its done!! Thanks for this lovely recipe! Since I’m off choru for quite sometime now, I’ll make this with millets and try. Looks so simple and delicious. I am a fan of rice and this dish sure looks yummy. I am going to try it soon with a chicken curry. Yummm! If there’s ghee in a recipe, count me in! This is not only tasty, but also so easy to make! 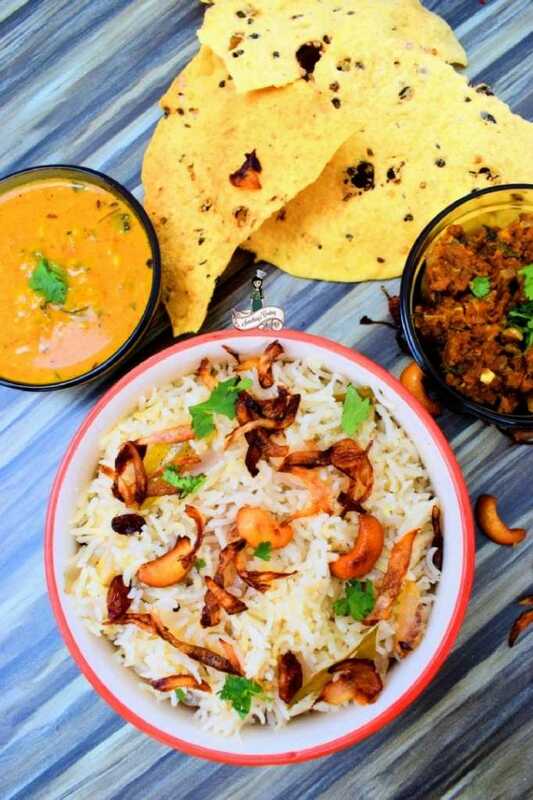 Hi Shalini, Loved your image of this delicious dish. Actually, I often make it at my home and call it as Fried-rice though the recipe for fried rice is not like that :-). 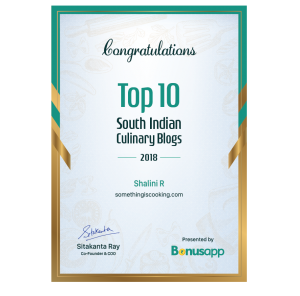 Yes, I learned this recipe from one of my Malyali Friends. Yum, yum. And so drool worthy. Will give this a go. I love my Puliogare rice too. This looks simple and I feel the aroma would be similar to Biryani. Thanks for the recipe.